In the fall of 2001, I was coming out of a yearlong Dark Night of the Soul. While my dreams had previously been an area of deep spirituality in my life, I was experiencing a fallow time in both my inner and outer realities. I felt trapped in a job that no longer held any creative potential for me and was feeling a deep void in my personal life as well. One night before falling asleep, I was experiencing emotional pain around these circumstances. I begged the Divine to enfold me in its loving presence and help me open to the inspiration that I needed to make positive changes in my life. That night I dreamed a big dream. When I awoke, I knew that something fresh and old at the same time had been awakened in my consciousness. A few weeks after having the dream, I shared it in my dream group. Later that evening a friend in the group felt inclined to tell me about an art exhibit taking place in Taos, New Mexico that he was thinking about attending. Although I had never been to, nor heard of Taos, I intuitively knew that this information was connected to my dream. As time went on, more information came to me about Taos in the form of several synchronicities in a row. Not long after having the dream, I went to see a performance of musician Robert Mirabal at the Mahaffey Theater in St. Petersburg, Florida, where I then lived—not knowing that he and his troupe were Pueblo Indians from Taos! At the end of their fine dance and music show, a huge video screen descended at the back of the stage on which pictures of Taos Pueblo Indians were projected – young children, ancient ones, pictures of the Pueblo buildings depicting the oldest inhabited Indian dwelling in North America, the High Desert and the sacred Taos Mountain. I was enthralled and in tears by the end of the slideshow. I had been ready to go on a trip to explore new vistas for quite some time. Now, I felt spiritually drawn to Taos and knew I must travel there even though I knew little about it other than the Mirabel pictures at the time. 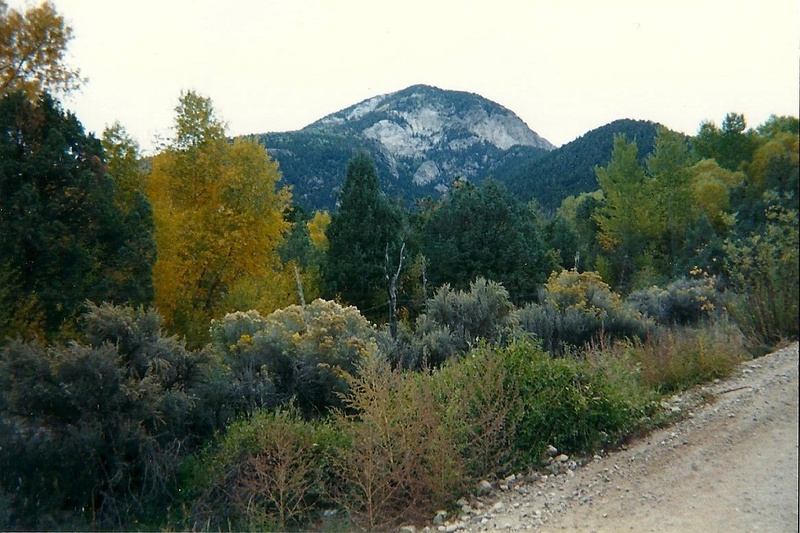 In April of 2002, my daughter, who knew of my desire to visit Taos, sent me information about a 7-day silent Metta retreat facilitated by Buddhist Dharma teacher, Marcia Rose. The retreat was to be held in at the Mable Dodge Luhan House in Taos that coming September. I wanted to go, but was afraid that I could not work out the logistics – I had no vacation time left at my job and my money situation didn’t look good enough to support the trip even if I did have the time. I wrote down my intentions to attend the retreat in my journal and continued to research and explore Taos on the Internet. As it turned out, a number of synchronistic events happened very quickly in succession that allowed me to go make the trip and spend an extra two weeks in Taos, communing with the High Desert land and making friends in the Taos Ski Valley hostel and the Neem Karoli Baba Ashram where I stayed after the retreat: I filed three years in back taxes and received a nice sum of money to put in the bank, was laid-off from my job due to funding cuts in the program I was managing, and my house rental agreement ended on the same day as the last day of my job, June 30, 2002! A week after I received the news of lay-off, a friend in my writers group asked if I’d like to house sit for her while she resided in Mexico off and on over the coming year. I could live the house rent-free during the times she would be at home for the cost of merely sharing the utilities. I now had time, money, and very low living expenses to be able to take my desired trip to Taos! The events leading to the trip and my experiences while there is material for a whole book, but I will end this account with a synchronicity I experienced while in Taos. It confirmed the precognitive nature of the dream I had about the ancestors singing and drumming in the mountains. I trust it will give you a feeling for the energy that connects me to that magical place. I am attending a 7-day, silent Buddhist Metta (Loving Kindness) retreat in Taos, NM. I come out of the night meditation room into the crisp fall air and take the path to the Mabel Dodge Luhan House cabin where I’m sleeping while on retreat. At the 7,550 feet altitude I could see clearly millions of lights in the night sky. I could also see myriad lights from fires flickering in the distance on Taos Mountain and hear drumming and singing from several different places on the mountain as well. I discovered that this was part of an annual ritual celebration that the Indians in the Taos Pueblo perform every year in the fall. Suddenly, I remember my dream of singing and drumming in mountains I had around this time last year, and feel connected to this place and its people beyond time and space. I look up in the darkness at a star-studded sky, and a feeling that all is well with the world comes over me. Upon returning from Taos, I felt rejuvenated and spirituality refreshed. I met and married my husband, Harold, and started a new job that was exciting and had just the right amount of creative challenge I’d been looking for in a vocation. Looking over the events that I recorded in my journal from that dark night when I asked the Divine for guidance and alleviation of my pain, to returning from Taos with a new lease on life, I am amazed how all the pieces came together to bring me to this place of transformation. The old me would have said, “That it was a miracle!” The now me knows that miracles happen all the time, and we are continually being given guidance on a daily basis. I’ve returned to the Taos/Santa Fe area many times since that initial visit. This past September I attended a women’s retreat—Feeding the Moon: Creativity and the Divine Feminine—with Jungian analyst and author Monika Wikman and Holotropic Breathworker Diane Haug at Ocamora Retreat Center located just north and east of Taos. I still feel the same thrill and sense of belonging to the land that I did upon my first visit to New Mexico in 2002. Thanks for sharing this story, Jenna. I love reading about your synchronicities and how they connect you to the Sacred. I’ve always been drawn to the Southwest as well, and learned a few years ago that on some Native American medicine wheels it’s considered the place/direction of spiritual introversion! That surely feels right to me! If I have hair on my back, it’s all standing with your 2002 experience at Taos. I’ve been there twice, but not for an extended period on spiritual retreat. I know it’s one of the spiritual power centers in this country. My area around Ithaca also has many retreat/meditation centers, Jungian oriented people, astrologers. It’s also the home of the Dalai Lama’s monastery in the United States, so we have a large Tibetan community,too. Unfortunately, the conquerors did in the indigenous population, but the names are still here. Beautiful experience of synchronicity (and trust) leading you out of the dark night to your new life. How many things came together to make this happen, and then it seems the magic didn’t stop. Most of my guidance comes from dreams. They became especially powerful and plentiful after my husband’s death. My dream therapist is away until Dec. 17, and my dreams are piling up. I’m excited to explore one with hundreds of orange snakes swarming on a banister-like support. For me, snakes are goddess energy and feminine power–the Ureaus of Egypt and the power of Hathor and Isis. Nothing like a great dream to lead the way. Thanks for your interesting posts. I subscribed.